The McDonnell Douglas MD-11 is a widebody Trijet powered by three engines. The MD-11 is based on the DC-10, but featuring a stretched fuselage, more wingspan with winglets, refined aerofoils on the wing and tailplane, new engines, extensive use of composites, and a two-crew, all-digital glass cockpit. 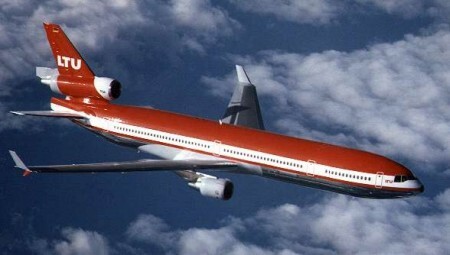 Production ceased after McDonnell-Douglas was acquired by Boeing in 1997. Until the end of production in February 2001, the MD-11 was assembled at the Douglas Products Division of Boeing in Long Beach, California. Two hundred aircraft were produced. The production ceased because lack of sales due mostly to unmet performance goals and competition from comparable aircraft, such as the Airbus A330, A340 and the Boeing 777. Two engine planes are simply cheaper than three engine aircraft. Currently, most MD-11 are used in cargo operations. Retired passenger versions of the MD-11, formerly used by airlines, are being converted into freighters. The MD-11 program was launched on December 30, 1986, with orders and commitments for 92 aircraft from 12 airlines and leasing companies. Assembly of the MD-11 began on March 9, 1988, with the first flight of an MD-11F (freighter version) on Jan. 10, 1990. FAA certification was achieved by Nov. 8, 1990. The first MD-11 was delivered to Finnair on Dec. 7, 1990. Finnair's first revenue service with the MD-11 occurred on December 20, 1990, when the aircraft carried passengers from Helsinki to Tenerife in the Canary Islands. First MD-11 service in the U.S. was inaugurated by Delta Air Lines, also in 1990. According to Boeing there was not sufficient market demand to warrant continued production of the MD-11. McDonnell Douglas originally projected that it would sell more than 300 MD-11 aircraft, but only a total of 200 planes were built. The last MD-11 was delivered to Lufthansa Cargo on February 22, 2001. The MD-11 was manufactured in four versions: passenger, all freighter, convertible freighter and combi, where passengers and freight are carried on the main deck with additional freight carried below the deck. Depending on configuration, the MD-11 can carry from 285 to 410 passengers. Fully loaded, the MD-11 airliner has a range of 7,630 miles (12,270 km), while carrying 285 passengers and their baggage. American Airlines and Delta Air Lines used MD-11's for intercontinental flights during the 1990's, but have since sold their fleets to FedEx. Current operators include Alitalia, China Airlines, EVA Air, Finnair, Gemini Air Cargo, KLM, Lufthansa Cargo, Martinair, Swiss International Air Lines(which recently retired its fleet), Air Namibia (operating a newly acquired Swiss aircraft), Varig, Thai Airways International, and World Airways. Swissair Flight 111, which crashed on September 2, 1998, was an MD-11. Three 267 kN (60,000 lbf) Pratt & Whitney PW4460s, three 276 kN (62,000 lbf) PW4462s, or three 274 kN (61,500 lbf) General Electric CF6-80C2D1F turbofans.